The Castelluccio di Cornia - also known as the Castel di Cornia and La Torraccia - is one of those medieval towers dotted throughout Maremma that sparks the imagination and just begs to be explored. You can see it from miles away sitting proud on top of a wooded hill in the Cornia valley. A green and lush valley that is home to hot rocks and a huge, long, silver snake! 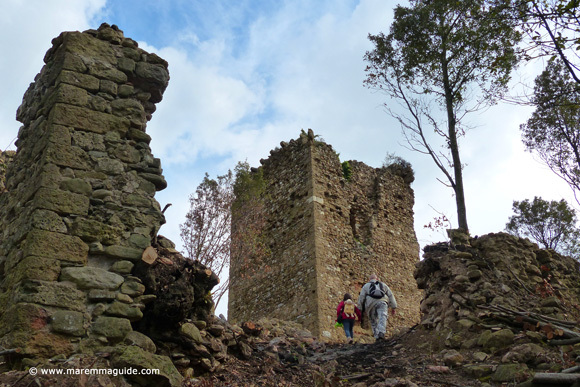 As Maremma castles go, getting there isn't that straightforward and the climb up to enter within its walls is very steep. But the view when you arrive is magnificent. View from the Torraccia with the town of Pomarance in the far distance. Best take a Google Earth view if you can before you set off to get your bearings. I did, and studied really well every bend and main marker from satellite, drew a map for the drive, but even that didn't prepare me for the difference in reality on the ground. I've prepared an annotated Google satellite map with my notes from the visit for you below. 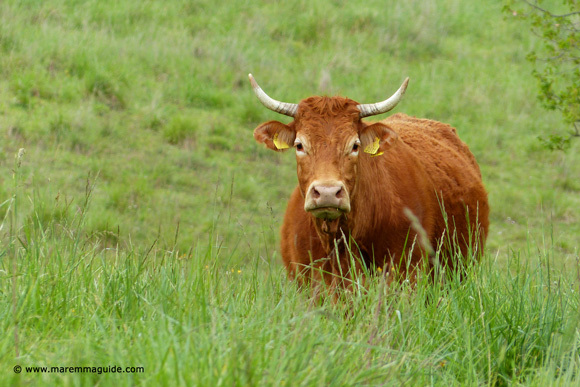 It will take you past fields of cows who will wonder who on earth you are disturbing their peace. Past a few locals out wild "asparagi" hunting (if you visit in the spring that is, otherwise it will be mushrooms that they will be searching for). And all the while, stunning scenery of the Val di Cornia, with quite a few abandoned houses in need of restoration that will get the romantic Tuscany dreamers amongst you contemplating taking one of them on. I did and I already live in this neck of the woods! My "marito" (hubby) spotted a LONG snake taking a walk in the spring afternoon sunshine... Eek! I am so glad I didn't see it in time! We were blessed with a truly wonderful treat, for a large hare came bounding, bounding, and bounding down the road towards us. He didn't seem at all perplexed by our presence, and kept ongoing, passed us and then dived off into the hedgerow. It was such a joy to behold :) I didn't even try to turn on my camera: I just wanted to watch him. And you'll have no trouble spotting the long outstretched wings, with quivering tips, of falcons hovering above the fields. There is very little written about the Castelluccio di Cornia - the latest and most recent online is by Antonella Manfredi in Italian . Other than that there are dotted mentions in archives and a brief history in an information sign in the nearby village of Lustignano. 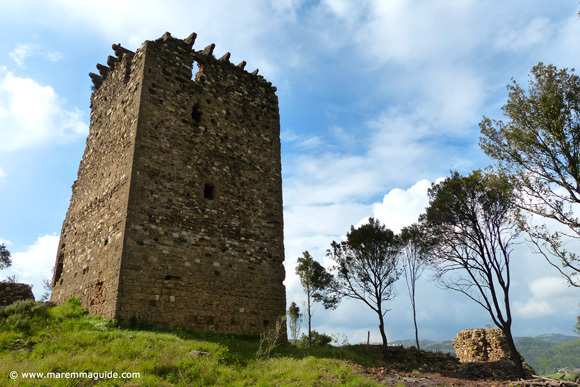 What is known is that the castle - which sits in the upper Cornia valley at the confluence of the Cornia river and its tributary, the Turbone - was built by relatives of the noble Gherardesca family around the year 1000. The first documentary evidence of its existence - the Intus Castelo de Cornia territurio voloterrense", is dated 1025. It had its own internal courtyard, monastery and church. 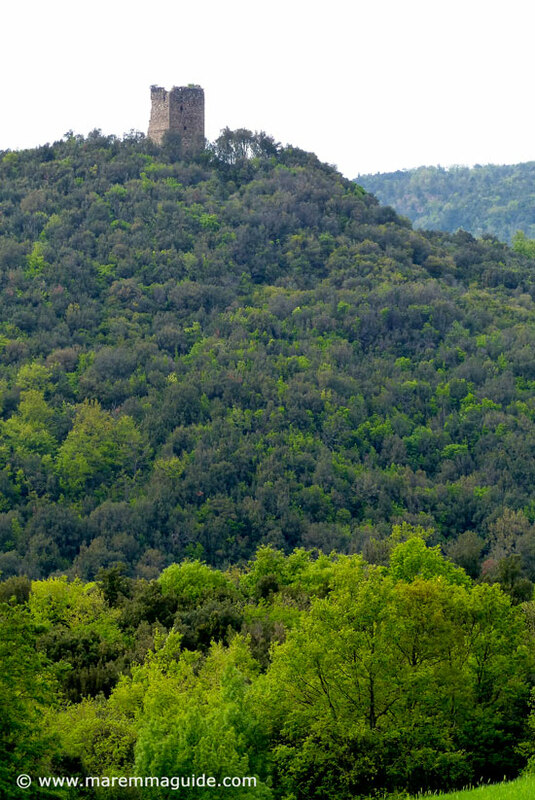 It's story thereafter replicates that of most of Maremma's castles: or frequent changes of hand - brought, sold, packaged-up as dissolution of assets, divisions of estates, claimed and fought over. 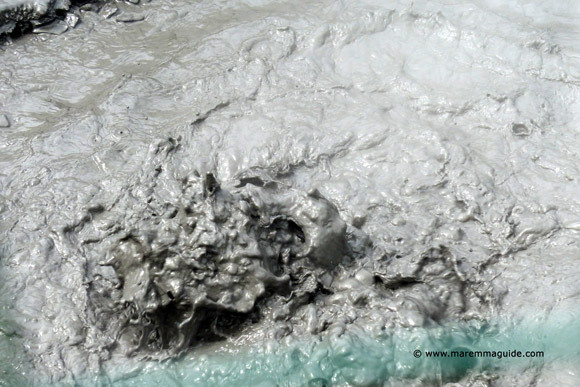 All related to the political and financial fortunes of the Bishops of Volterra and Massa Marittima, the emerging cities of Firenze, Siena and Volterra, and the desire to control and own the rights to the important and rich silver, sulfur and alum mines in the surrounding metalliferous hills. All of which led to the castle walls being destroyed more than once, and its original eleventh century tower - with a drawbridge into its first floor on the north-west side - being repeatedly torn down and rebuilt, and extended. What you see today - standing at about 16 metres tall on its south-east and south-west sides - isn't its full glory. The accommodation above the more functional defensive structure below, reached above the coronation that you can see on the south-east and north-east sides; a defensive structure rather than decoration that provided the supports for the wooden floor above. If you want to see this "castello" as it is in my photographs and video, you should plan a visit sooner rather than later. For, although the long structural crack down one side of the tower - the result it is believed of the construction of an internal latrine! - has well stood the test of time, the substantial plant growth on the top of its walls, their penetrative roots systems and general decay of the mortar binding its stones together, are making it unstable. It will fall down one day soon. The encircling castle walls have long since mostly disappeared - we walked over many of their stone parts strewn up the hill and around the tower - if not from the effect of natural invasion by trees and roots etc, but certainly by deliberate demolition to enable tree-felling machinery access to the top of the hill. "Peccato". 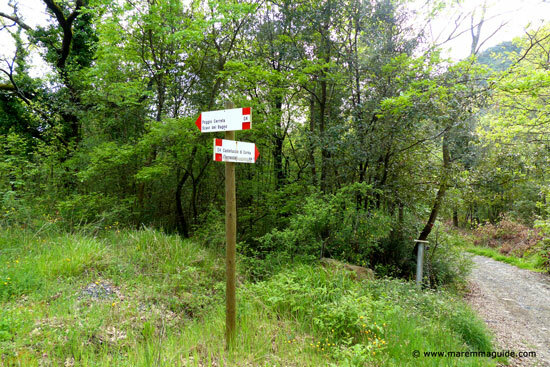 The start of the footpath - the "sentiero" - is marked along the lane by these signs. There is a chain across the beginning of the gravel single-track that takes you down through the wood, across the river again and through a metal double gate, and up the hill. 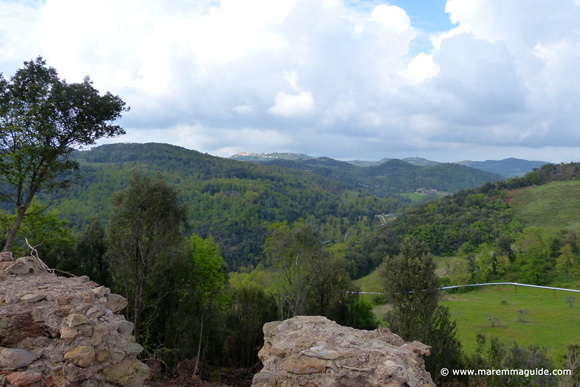 But note that the entire route is private property and ends outside the front door of a very lovely, large and currently being restored Tuscan villa with a fantastic view of the castle. You don't want to drive down this track. You risk not only being chained in at its beginning, but caught behind a locked gate too! We got locked in! I mistakenly thought that the owners of the field between the villa and castle were those with whom we had spoken with earlier in the day to obtain permission to enter. But it turns out that that isn't the case, and that when the villa owners returned home they locked the gate behind them at the river, before spotting our car alongside the track at the top of the hill. NOTE The owners of the land in which the castle sits are happy for you to visit - you don't need to call them. But take note that you are not permitted to access inside the tower - you can't readily anyway, but be aware. Luckily, the owners of the villa were gentle with us and drove back down the track to let us out. It turns out that they are part of a volunteer group that have cleared the woodland around the castle and are trying to get it recognised as a protected site etc. 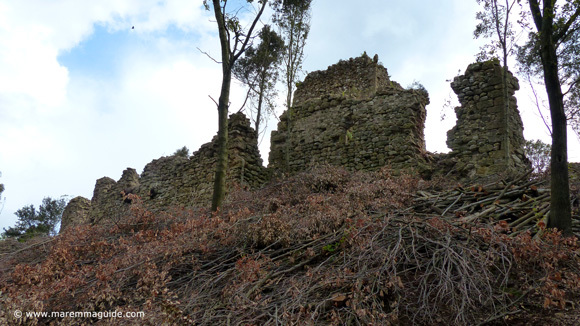 The woodland overgrowth on the castle walls and inside has very recently been cleared - this photo was taken Easter 2014. The proper footpath proper to the castle takes you from the road sign, along the lane, and then across the river (away from the track) directly up into the wooded hill. It is also currently being cleared. And the old footpath that is well overgrown from the closest village - Lustignano - is also scheduled to be cleared and re-opened soon. 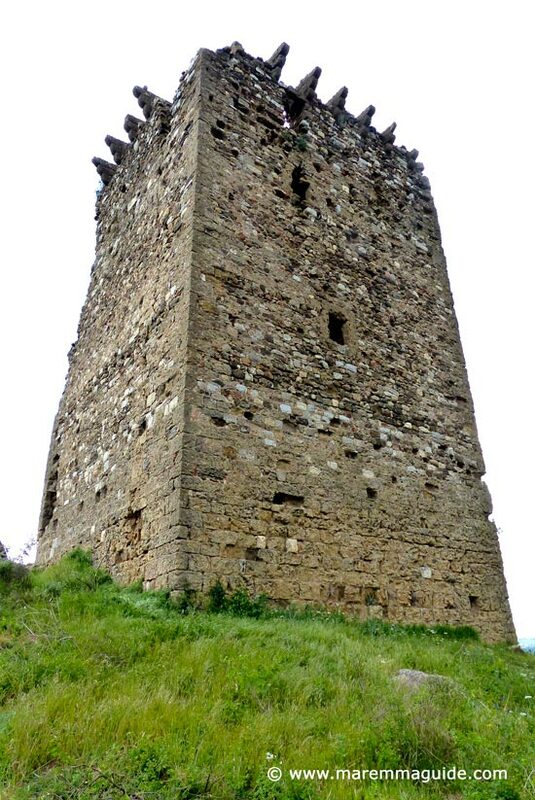 My daughter, Sophia, and I had asked in the village whether we could trek to the tower but were very strongly advised that it had become impossible and dangerous as the macchia and "bosco" was especially "fitta" (thick). So when we got home that day I started to Google Earth the location and track down the owner... I love castles and the more hidden they are the more enticing! And that's how hubby got to take us the next weekend instead of going fishing. I did entice him with the promise of fishing in the River Cornia, and he brought his fishing rods and bait with him, but declared the river too shallow and wide to be a good fishing location. It did make for a great drive through it at speed, making the river water spray up high and the girls in the car scream! Which was repeated at the request of the youngest in the car and videoed! OK, the directions map. Directions are from Lago Boracifero. G - you won't notice this as a junction, just a bend in the road. H - on the ground this is just a bend in the road rather than a T-junction which it looks like in satellite mode. I - You need to take the second on the right exit after you have passed the energy plant at Lago Boracifera.